What is happening to middle-wage jobs in the District? 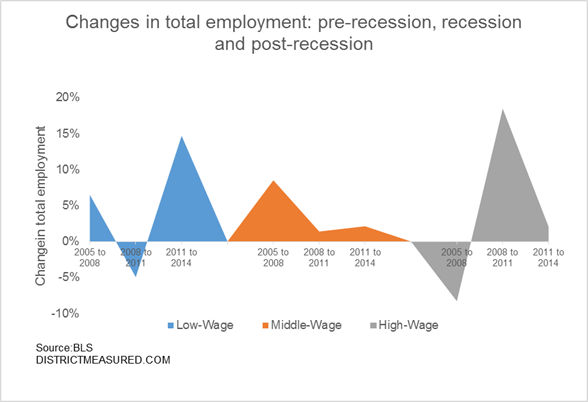 Middle-wage jobs lost a lot of ground during the great recession, but they are making a comeback across the nation. 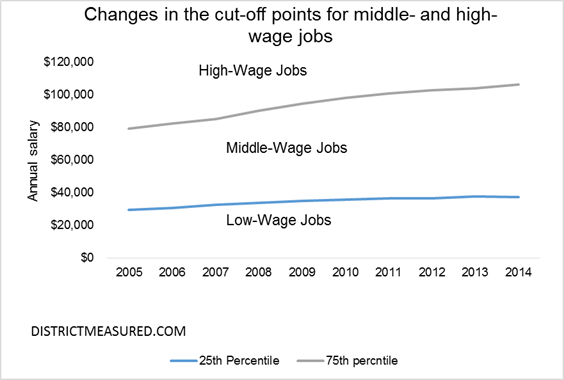 Yet high-wage and low-wage jobs are growing faster than the middle-wage jobs, suggesting that over time, the job market will be more polarized. Is the job market in the District becoming more polarized? To see this, we looked at employment and wage data by occupation for years 2005 through 2014 (BLS just released the 2014 data on March 25). We then grouped the data by wage level (low, middle, or high). Middle-wage occupations have median salaries that fall within the 25th and 75th percentiles of the annual wages paid in the District. We define occupations with median wages below the 25th percentile as low-wage, and occupations with median wages above the 75th percentile as high-wage. This grouping exercise reveals interesting things about our city. First, a low-wage job in the District pays a lot (but might not buy much): In 2014, the District’s 25th percentile of the annual wages, at $37,440, was greater than the U.S. median wage of $35,540. Second, middle-wage jobs–the bulk of positions in professional and business service areas, health, and education–have grown through the recession, but they are no longer the engine of District’s economy. These jobs never went away, but their growth declined with the recession, and never really boomed. Occupations that pay low-wages—these include positions in retail, food services, grounds maintenance, and personal services—have more than recovered from the losses during the recession. These jobs have been the biggest source of increase in employment since the official end of the recession. Between 2011 and 2014, the District added about 21,000 low-wage jobs, easily reversing the loss of 7,500 jobs in this category during the recession. Finally, high-paying jobs increased rapidly during the recession, first due to federal hiringand then with population growth, but the growth in these occupations have also slowed down. The composition of middle-wage occupations could change over time. Middle-wage occupations are changing either because these occupations are no longer needed in the District economy, or because these jobs are no longer middle-wage. Between 2013 and 2014, middle-wage jobs declined by 9,700, partly because there were fewer accountants, property, real estate, and community association managers, fundraisers, counselors, and legal secretaries. Another part of the decline was that some occupations typically considered to pay middle-level wages transitioned into low-level wage occupations. For example, office and administrative support workers (about 2000 of them in the District) made the permanent transition to low-wage workers around 2012. Of course, some office and administrative support workers still get paid a middle-level wage, but if one were to look for a job in this occupation, chances are his or her salary would be less than $37,400. The interactive graphs show the number of jobs paying middle-wages and the number of occupations that could be considered middle-wage under each major occupation category. What exactly is this data? We used BLS Occupation Employment Statistics to construct a series of low-, middle-, and high-wage occupations. Low-wage occupations are defined as occupations with annual median salaries below the 25th percentile of wages for the entire city in the same year. High-wage occupations are defined as occupations with annual median salaries above the 75th percentile. Middle-wage occupations lie in between. Should we all just pack up and move to Columbus? The District is one of the most expensive places to live in the country. That could be why Columbus is trying to woo D.C. residents. The city of 800,000 in central Ohio, anchored by Ohio State University, has placed ads in Metro tunnels recently. Many of them seem to target millennials. 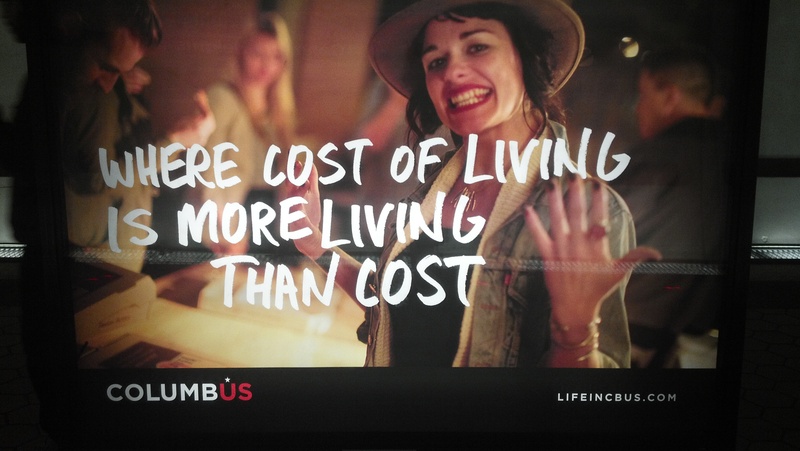 One ad, below, specifically points out Columbus’s affordability. So how much cheaper is Columbus than D.C.? Let’s take a look at the numbers. Living in Columbus isn’t going to save a typical millennial as much as you might expect. 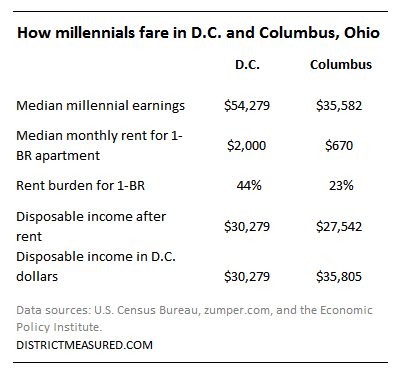 Housing is much cheaper in Columbus but millennials in D.C. tend to make a lot more money. The result is that in both places a typical millennial renting a one-bedroom apartment would have about $30,000 left over for other expenses (before taxes). In Columbus this would go further, but not much – we estimate it’d be like having around $36,000 to spend in D.C. But this difference might be negligible since many D.C. millennials reduce their costs by having roommates and not owning cars. The equation changes for D.C. millennials making below the median income. They might be able to save more by moving to Columbus if they could get a job there without a drastic pay decrease. Some of the ads seem to target young creatives, some of whom might fall into this group. Plenty of millennials are betting on career trajectories that will make them enough money to keep D.C. affordable to them. If they want to buy a house or have children, though, costs will go up even more relative to those in Columbus. The median cost of a three-bedroom, two-bathroom home in D.C. is $788,000. In Columbus it’s $222,000. Child-care for two children in D.C. is 75 percent more expensive than in Columbus. D.C. millennials might not be considering a move to Columbus now, but in several years they might re-think the numbers. Profile of high income earners in D.C., New York and California: What makes them differ and why does it matter to us? In a recent District Measured blog we analyzed the income distribution of D.C. residents. We wanted to expand on this analysis by looking at income characteristics of high income individuals in the District compared to their peers in other states in the nation. New York and California were chosen for this comparison because of a similar concentration of high income earners. 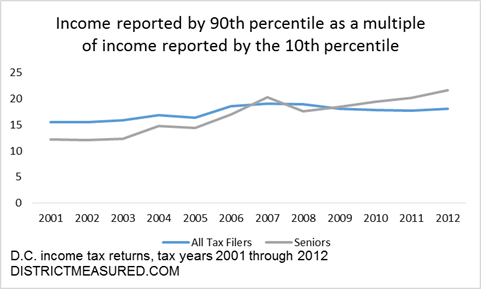 High income earners, or wealthy individuals, are defined here as tax filers with Federal Adjusted Gross income greater than $ 1 million. Though small in numbers, they account for a disproportionately large share of overall income in these states and in the nation. 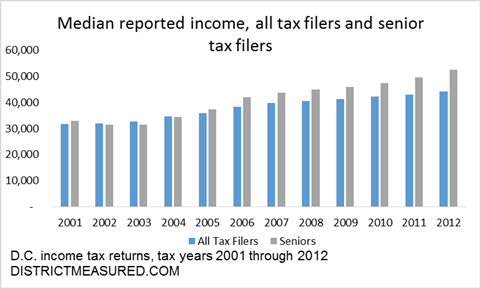 In D.C., in tax year 2012, they accounted for less than 0.5 percent of all filers but more than 22 percent of income. The share of overall income earned by these wealthy individuals varied from a low of 19 percent in California to a high of 25 percent in New York. For the U.S. as whole the share was 15 percent. 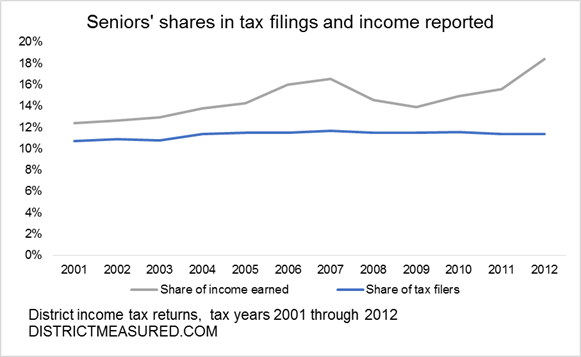 These statistics clearly reveal that the concentration of income among wealthy filers is substantial and this has become the subject of intense debate and research. Wealthy individuals generally derive income from various and often volatile sources of earnings related to the stock market and business profits. This makes our job of forecasting income tax revenue both difficult and interesting. In analyzing these different sources of income, we need to consider if specific sources of income are more important in the District and therefore need to be examined more closely when looking at broader macro-economic trends. 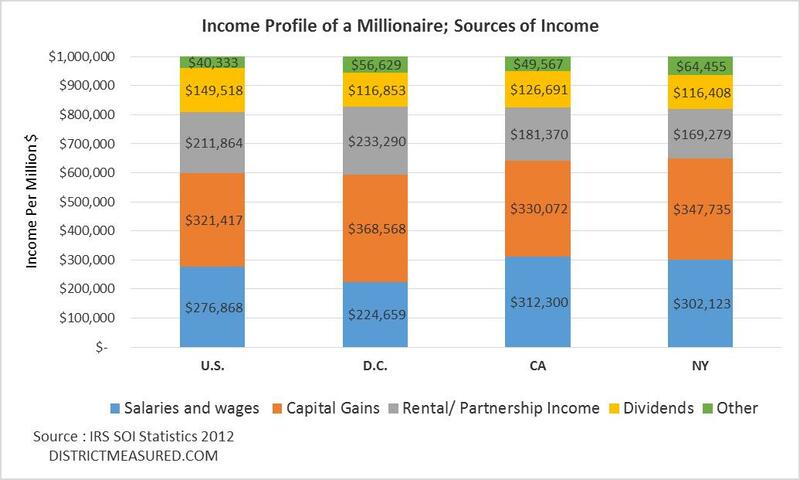 In the District, a millionaire has a relatively higher share of income associated with capital gains and rental/partnership income. Rental and Partnership income for a millionaire in the District, at $233,000, was nearly ten percent higher than the U.S overall and considerably higher than both California and New York. Income from Capital Gains as share was also highest for a District millionaire, at $369,000, followed closely by New York at $348,000. In contrast, Wages and Salaries are a relatively smaller source of income for District millionaires, at a “low” of $225,000. The District does not have the same concentration of high-paying finance and tech jobs, with large salaries and bonuses, that are a much larger source of income for wealthy residents in New York and California. 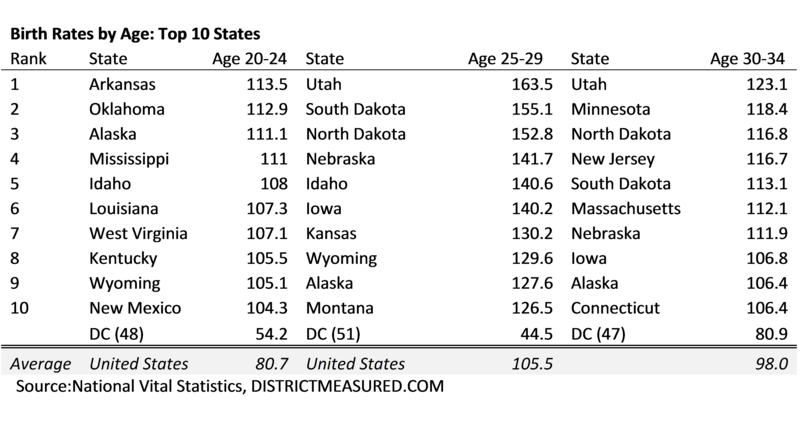 Dividends were a larger source of income in the nation overall, than in the states shown here. Other Income, which includes interest income and other sources, was a smaller source of income for all places. Note: Given the volatility of these income sources, we also looked at 2010 and 2011 data to see if the relative differences in share of earnings among the states varied significantly from those shown above. The share of capital gains declined in all these places in 2010 and 2011; 2012 was a particularly strong year for capital gains realizations due to federal tax law changes. 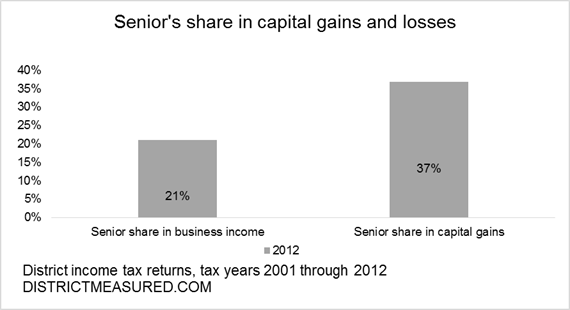 The decline in the share of capital gains income was similar for all places. However, Rental and Partnership income remained a much higher source of income for the wealthy D.C. residents compared to these other areas. For each area the average millionaire is computed by taking the share of each source of income and multiplying that share by one million dollars. The shares computed are therefore averages for each one million dollars of income and not the total amount of income. As with all data that is averaged, there could be great variation among millionaires. We use the words income and wealth interchangeably here because wealthy individuals derive income from assets as well as labor. 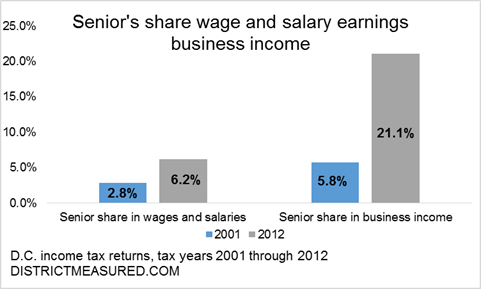 Data in this report is from the Statistics of Income (SOI) data published on the IRS website. 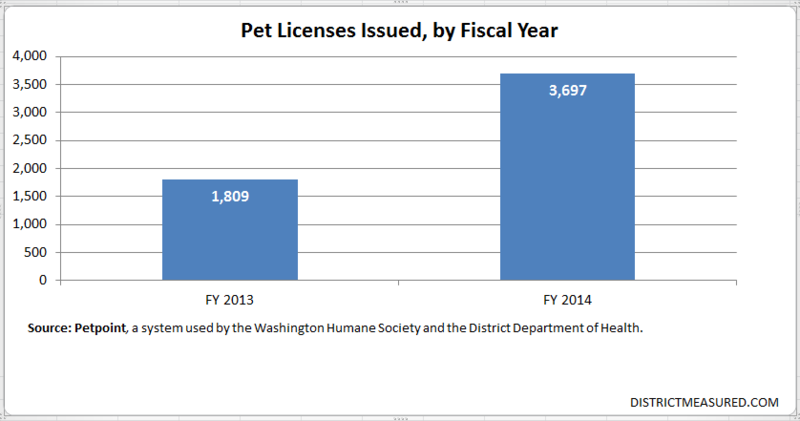 The data can be accessed by clicking here. The District’s birth rate was 6th highest in the Nation. For adult-aged women, births tend to occur later in life compared to women in the Nation. High housing costs could be a factor. The District has enjoyed strong population growth in the past 10 years even as growth appears to have slowed in 2014. What accounts for this rapid growth? In this blog we examine one of the components of population change–births. We will discuss the other components–migration and deaths–in subsequent blogs. According to recent statistics published in the National Vital Statistics Report “Births: Final Data for 2013”, the District’s birth rate, defined as births per 1000 population, was sixth highest in the Nation in 2013. There were 9,338 births in the District which measured against a population of approximately 645,000 translates into a birth rate of 14.4 births per 1000 residents. This compares to an average of 12.4 births per 1000 in the Nation. 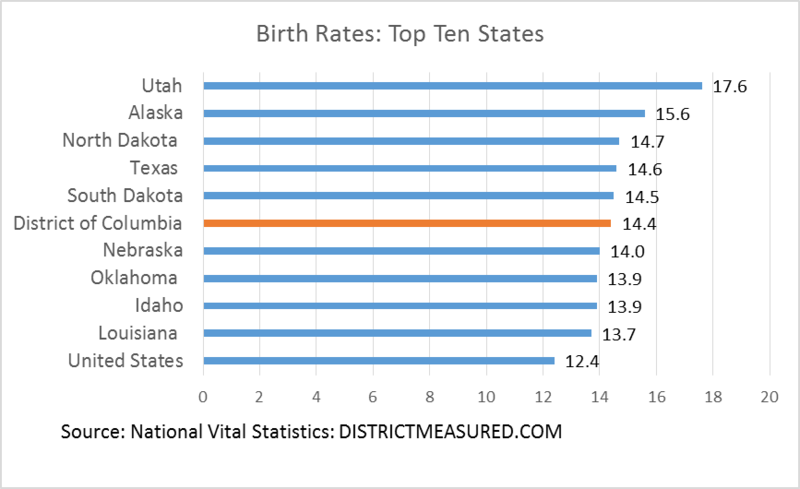 Ten years ago in 2003 the District’s birth rate was 13.5 compared to 14.1 for the nation. Looking at the statistics in more detail reveals interesting differences in the age of women when births occur in the District compared to the Nation. Births occur later on in the lives of adult women in the District. For ages 35 and over, the District ranked first in terms of birth rates. The top 10 States were largely concentrated in the Northeast. Connecticut, Massachusetts, New York and New Jersey were consistently ranked in the top 10 for ages 35 and over. Alaska, Hawaii, Maryland and California also had high birth rates among women in these age brackets. For ages 40 and over the District’s birth rate was twice the national average. For the nation overall there has been a secular increase in births occurring later in lives of women. The rate for women aged 40 to 44, has doubled from approximately 5 percent in 1990 to over 10 percent in 2013. We do not have long-term historical data for this age group in the District but in 2008 the birth rate was 16 percent in the District compared to 9.8 percent in the U.S. In recent years, the growth in the birth rate for this age group has far exceeded the national average. In contrast for adult women aged under 35, the opposite occurred and the District ranked almost last for this group. Interestingly the District’s ranking dropped rapidly for the cohort aged 30-34 while several Northeastern States: Connecticut, Massachusetts and New Jersey were still ranked in the top 10. It is important to note that the District also ranked highest in the nation for births among non- adult aged women even though birth rates have been declining for this group over the past 20 years. For women aged 15-17 the birth rate was 23.9, almost twice the national average, and for those aged 10-14 the 1.6 birth rate was more than twice the national average. Various factors are often cited to explain differences in birth rates among age groups of women. These factors include, among others, socio-economic, ethnic, educational attainment, and cultural factors. A body of economic and demographic research has recently emerged examining how high housing costs may also affect and delay household formation decisions. A study by William A.V. Clark for the California Center for Population Research, finds that high housing costs can delay the first birth by as much as three to four years. As noted in the study, the relationships between these factors and causation effects and directions can be very complex. For instance do higher housing costs cause people to get more advanced degrees and therefore delay household formation in order to be able to afford housing, or is the direction of causation the opposite way? 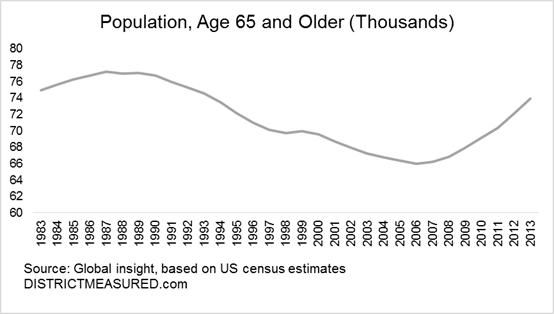 All this suggests that the effects of housing prices on demographics and ultimately tax revenues need to be watched very closely. What exactly is the data? Birth rate data is from Martin JA, Hamilton BE, Osterman MJK, et al. Births: Final data for 2013. National vital statistics reports; vol 64 no 1. Hyattsville, MD: National Center for Health Statistics. 2015. The report can be found here. Evidence on the effects of housing prices and household formation is from William A.V. Clark, and can be found here.